There are times you might long for the relaxed leisure of the spa experience, but with the cost of a manicure it’s not always a pleasure one can afford. If your current bathroom set-up isn’t the optimal place for rest and relaxation, here are some cues for how you can turn it from a bit of a problem to a consummate pleasure. The look of slick steel and porcelain can certainly be classy, but if you’re looking for an upscale room you’ll love to spend time in, consider a vintage dresser that you can turn into your very own unique vanity. While you’ll need to develop some plumbing and woodworking know-how to make this dream a reality, it will easily fancy up your bathroom and lend for an elegant, everyday experience. Part of the spa experience is often the palette of jewel-toned colors that are used on the walls, but it can often be considered a risk to take on such an intense tone in one’s own bathroom. However, if you have a smaller sized bathroom and can find a brilliant color you really love that will work with your decor, it may make for a unique and singular spa-style experience. 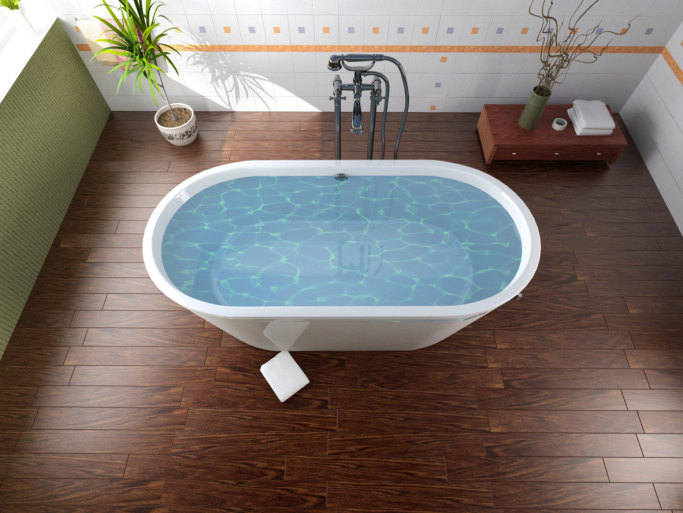 A sizeable Jacuzzi that you can really get comfortable in is a great start for an in-home spa experience, but there are some stylish ways you can add to it that will make for a particularly sophisticated look. Instead of taking out the tub, pick a colorful tile that will mesh with the other colors and textures of your bathroom to add an accent. It’s not necessarily a simple fix but it will add a lot of oomph. It goes without saying that a shower curtain does not always provide for the most sublime of bathroom experiences, so one step towards your own ‘in-home Spa’ may involve the addition of a walk-in shower. While this can be an expensive upgrade, it can completely change the look and feel of your bathroom, and might just mean you’ll save on manicures. The spa experience can be enticing for the relaxation and comfort it offers, but you can create a similar experience in your own bathroom with a few changes that will elegant it up. If you happen to be renovating your home because you’re planning to sell, you may want to contact one of our local real estate agents for more information on homes available in your area.